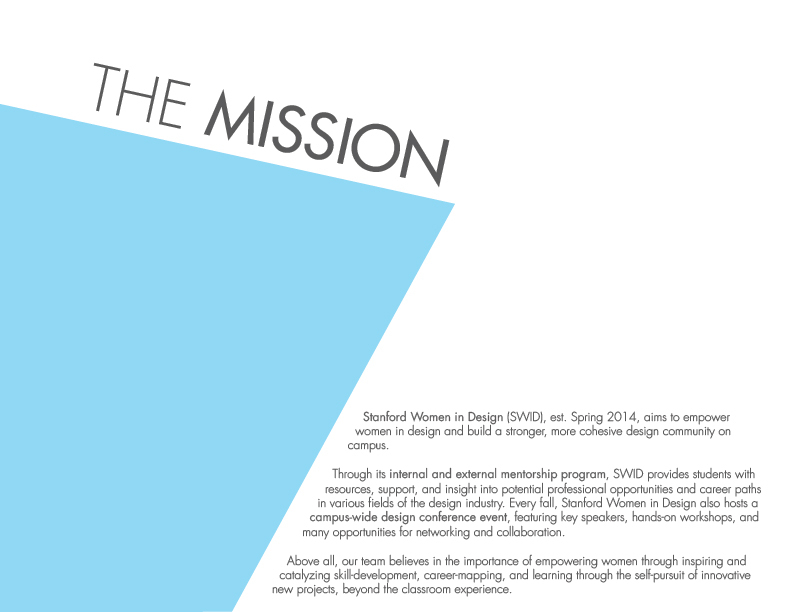 Stanford Women In Design (SWID) - designed to empower women in the design community at Stanford and beyond - first launched as a student-run design organization at Stanford University in Spring 2014. When I heard about the team, I felt instantly compelled by their vision to inspire female leaders in the design industry. Within a few weeks of SWID's official registration on campus, I joined the founding team as the Director of Branding Design. Stepping into this leadership role, I took full creative license in building the brand of our team from scratch, including designing and developing our website, logo, online and offline marketing materials, and branding spec sheet (Adobe Photoshop, Illustrator). Through this opportunity, I also played an integral role in setting the tone for our team and defining our vision for creating social impact in our community. My first major project as the Director of Branding Design involved designing our team's logo. Feeling inspired by our conversations and comfortable with my understanding of our team's overarching vision, I set off to mock-up my first batch of design ideas on Illustrator. While the designs started off very simplistically, they later became much more complex as I began to play around with color/opacity gradients. I also explored breaking down the letters into more geometric shapes. A week or two into my design process, our team shared a conversation about the SWID philosophy that inspired me to explore ways of emphasizing the "W" more in our logo design. Making the "W" stand out felt symbolic in that we identified ourselves as female designers striving to empower other women as leaders in the design industry. One of my approaches to making the "W" pop more in the logo was to break down the logo into just SW, rather than SWID, and include smaller text to elucidate "in design." As I shared these logo designs with the rest of the team and we collaborated on more ideas, one of the comments made by my team that particularly resonated with me was about making the logo simple, yet fierce. We discussed bringing in sharper lines and edges to the logo, and I continued to mock up more designs on paper and on Illustrator. My new batch of design work revolved around giving our logo more edge, even a weapon or sword-like touch. We also realized that all of our previous designs had included the full "SWID" name in some way, shape, or form. For example, the logos either included all 4 letters of SWID, or at the very least, the 2 letters of SW and then text for "in design." We wondered, what if we just broke down our logo design into one very simple "W" shape? And there you have it. The simplicity of this design felt almost too easy, especially compared to the busier logos that we had most recently been considering, but it felt right. The color gradient between the two triangles was just enough to draw the eye, without ever confusing the viewer or making him or her feel lost in its form. We were able to properly emphasize the W and develop a design that stood neatly on its own - as just the W - as well as with the "Stanford Women in Design" caption, but the two never felt married to one another. Furthermore, we hoped that this made the logo easily flexible and adaptable to other marketing material forms, such as flyers, brochures, stamps, merchandise design, and more. It was almost ironic how simple our final design ended up being, given that we had spent about a month playing around with a diverse range of ideas. However, we were grateful to have used the logo design process as an opportunity to carefully define ourselves as an organization and spark conversations about the real impact we sought to make as a team. We wrapped up our logo designs towards the end of August 2014, with about one month left before Fall Quarter at Stanford would begin. We knew that this last month of the summer would be imperative for our team to prepare to present ourselves on campus as an official organization in the fall, and more importantly, recruit new members extremely effectively in order to form a strong team for the rest of the year. For our first series of marketing materials, we envisioned an informational pamphlet that could be physically posted around campus bulletin boards, emailed out as a flyer, and handed out at events such as Activities Fairs to prospective new members, in order to spread awareness about our team. The process of designing and developing our team's logo and first round of marketing materials gave me the insight and creative confidence to set forth on building our team's first major branding spec sheet. Creating this branding spec sheet helped me solidify my ideas and vision, as the Director of Branding Design, for how I sought to advance our team's online and offline presence in the future. 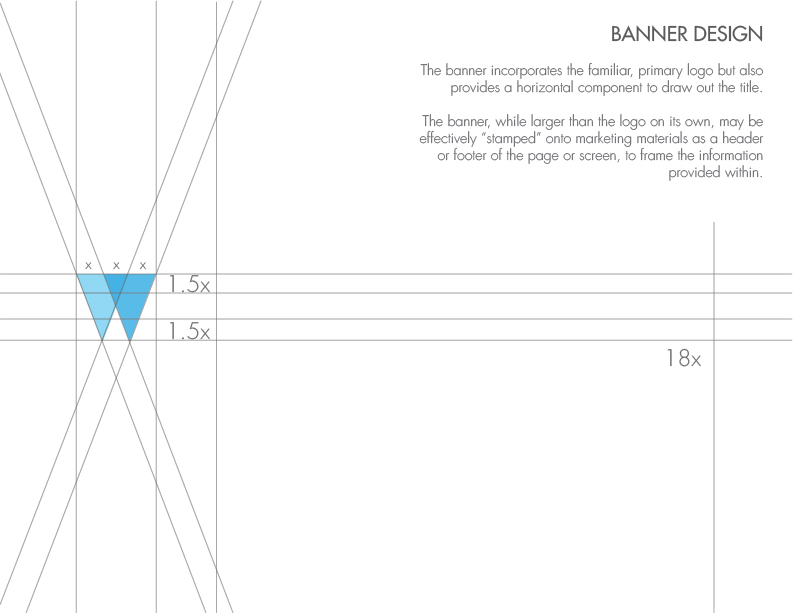 The document additionally helped me guide our Marketing Team to explore our brand in a consistent and reliable fashion. I also researched a bunch of different existing company Branding Books for inspiration, such as that for Nike Football, I <3 New York, Skype, Foursquare, Adobe, and more.